The luxury custom Apple slate comes in gold, platinum, and rose gold, for a price of around $2,800 USD. As it usually happens with such big product launches, Goldgenie announces they open pre-orders of the custom gold-plated iPad Pro at the same time as the regular tablets coming from Apple hit the market. The London-based maker of luxury custom handsets and tablets will offer the iPad Pro in gold, platinum, and rose gold versions. The hardware under the hood remains the same - quad speakers, 12.9-inch Retina display, the new Apple A9X processor, and all the other goodies. Concerning the slate's looks, nothing is too much for Goldgenie - custom laser engraving can be also added to the pre-orders, including exclusive corporate logos or monograms. 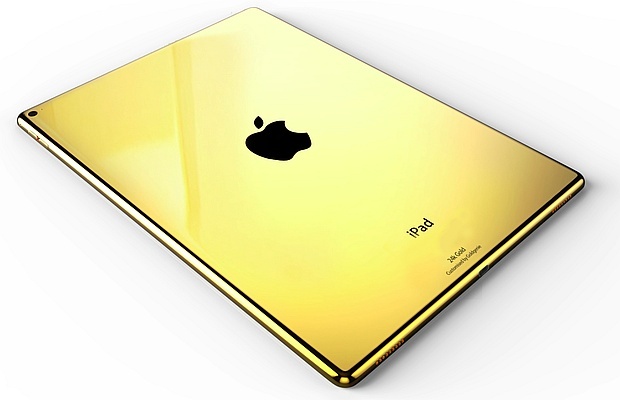 Unfortunately, such luxury (some may consider it kitsch despite its financial value, of course) comes for a steep price - pre-orders require an advance of roughly $1,500 USD, while the full price of a custom gold iPad Pro starts around $2,800 USD.